At the age of 9 she enters the Paris Opera Ballet school. At the age of 16 he joins the company as a member of the corps de ballet and in 1977 she is nominated Danseuse Etoile. She dances the main parties in Giselle, Le Lac des Cygnes, Coppelia, La Sylphide, Suite on Blanc, La Bayadere, Les Mirages, Concerto en Sol de Bobbins, Palais de Cristal, Apolon Musagete, La Somnambule, La Valse de Balanchine, Petrouch-ka de Fokine, Yvan le Terrible et Romeo et Juliette de Grigorovitch. Various ballets were composed for her, among them are: Metaboles de MacMillan, Adagietto de Araiz (1977), Serait-ce la Mort tie Bejart (1979), Manfred de Noureev, Le Fantome de I'Opera de Roland Petit (1980). In 1980 she leaves ГОрёга de Paris for le Baliet National de Marseille where she performs in Notre Dame de Paris. Coppelia, Cyrano de Bergerac, Proust, ou Les Intermittences du Cceur, La Nuit Transfiguree, Art Zoyd. She performs She main female roles in the ballets Les Amours de Franz staged in Marcell in 1981, Les contes d'Hoffmann staged tr Monte Carlo in 1982. Prelude a I'Apres-midi d'un Faune, at the concert dedica?ted to Debussy, the role ot Catherine in the ballet Les Hauls du Hurievent stagec in Paris in 1982, the role of Autumn in Les Quatre Saisons. In March 1985 she dances Pas de Deux-de I"Ombre et de la Lumiere in the ballet Le Manage du Ciei et de I'Enfer, then the role of La Chimere in Symphonie Fantastique. the role of Princesse in Le Chat Botte and the role of Rosa Frolich in I'Ange Bleu staged in Marselte in 1986. She dances in Le Jeune Homme et la Mort, Roland Petit creates for her the ballet Ma Pavlova, the first show of which was in the theatre Liceo de Barcelone in October 1986. and later in November 1986 it was performed in ГОрёга de Marseille. After this the French and international media called her the greatest French dancer of her time anc Ballerina Assoluta. 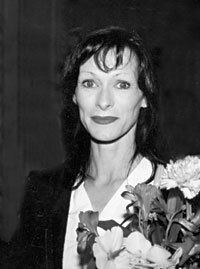 In addition to I'Ordre du Merite, in 1987 she receives from the Minister of Culture le Prix National de la Danse and nomi?nated Chevalier des Arts et Lettres. In October 1990 she creates the role of Aurora in Roland Petit's ballet La Belle аи Bois Dormant in ГОрёга de Marseille. In February 1993 she performs the role oi the girl in the balet Chariot danse avec nous. Again she participates in the ballet Cheri, and in December 1993 she dances the role of Bella in La Chauve Souris on the stage of ГОрёга de Mar?seille, and in March — the roie of Maria Vetsera in Valse triste, this role she receives la medaille de la ville de Rome. For the performance in the ballet Le Guepard in 1995, she is awarded ie Prix Benois de la Danse in Moscow. She used id hold classes in the National Superior Dance school in Marcell. In 1999 she was invited as the ballet teacher to Paris Opera. Since September 2000 she has been teaching in Paris.